Breaking News! There is a new Get It Scrapped membership! This 6-month, all-access pass to 34 ebooks, 200 video interviews and 40 video tutorials is only $48 through Monday, December 2nd. It will never be priced this low again! All the pdf's and videos are downloadable for you to keep on your computer. Click here so you don't miss this offer (and the opportunity to lock in at this low rate) I personally can't recommend this highly enough and hope you'll join us in 2014! The December Gallery is up over at Write.Click.Scrapbook.! This month's theme is Holiday Traditions. 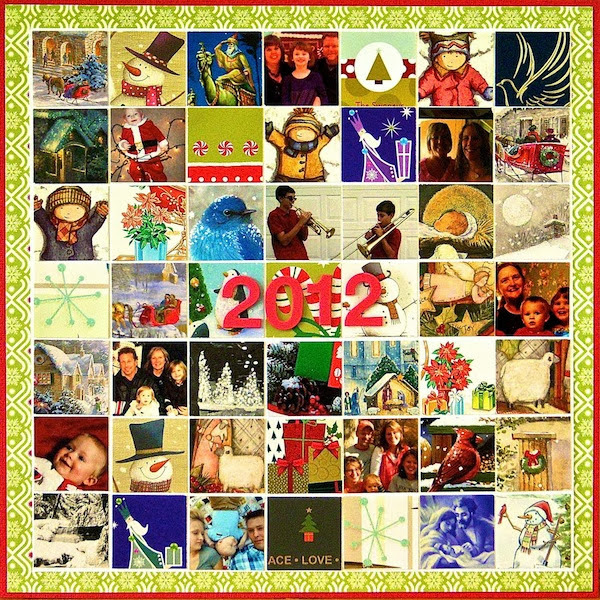 This is a layout I create every year using a square punch and all the Christmas cards we've received. The idea is not original with me. I think I saw it on Ali Edward's blog years ago. It has become a holiday scrapping tradition! You can find more inspiration from the rest of the team right here. What holiday traditions do you enjoy celebrating? Adorable page idea - where ever it came from. I do know where it is likely to show up soon! I love this Sue! I've hung onto my photo cards and stuff and plan someday to do this as well! Fabulous job! What a great idea! I want to give that a try this year. Wonderful page, you did a great job! Awesome idea Sue, and I love the look of this page! What a great layout, seeing it makes me wonder why I ever got rid of my Creative Memories square punches. What a beautiful way to preserve these holiday memories, Sue. I love this! Welcome to the MSD family, Tammy! I think you'll love it. Hope you have time to check out the forums and galleries. It's a nice little family over there and we would welcome you with open arms. I do the same thing! I saw it on Ali's blog, too. Love this idea Sue! Also, I remember that you might be doing a class in January? I would love to take it but i need a little time to budget the cost. Will you be letting us know soon when you are having the class and the cost? Hi Marcia! Thanks for your question. I am indeed working on a new class, but don't think it will be ready by January. Maybe February? As soon as I have more information, I will post it here on the blog. I think we'll also run Perfect Your Scrapbook Process again in the spring. I've done the square punch layout once, too, and really like it - yours looks great!